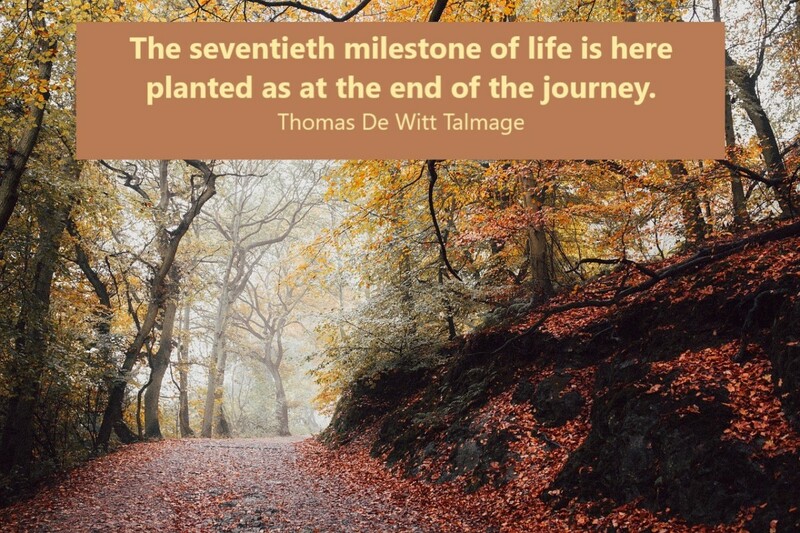 In anticipation of turning seventy this year (2019), this author reviews and reflects on salient points of a sermon preached by a renowned American clergyman, Thomas De Witt Talmage (1832-1902). He discussed the journey of life from the twenties to the seventies. The italicised statements following my sub-topics are paraphrased summaries of Talmage’s perspective. The brief reflections are mine and are intended to encourage those of us becoming seventy as well as those who have journeyed past it, to embrace the privilege of future birthdays with joy. In our twenties, we were chasing success, forming connections, deciding principles and habits which would guide the rest of our lives. Those were our college days, followed by our first experiences of living on our own. We were happy for the independence, but we missed the security of home. We tried many things for the first time, and made friends in the process. Now, whether we meet an old college classmate whom we barely remember, or we meet one with whom we communicate regularly, our conversation is the same: activities which held our mutual interest, which made us laugh, which taught us principles we learned and by which we still live. Fighting and winning, awards and defeats are no longer on the agenda. 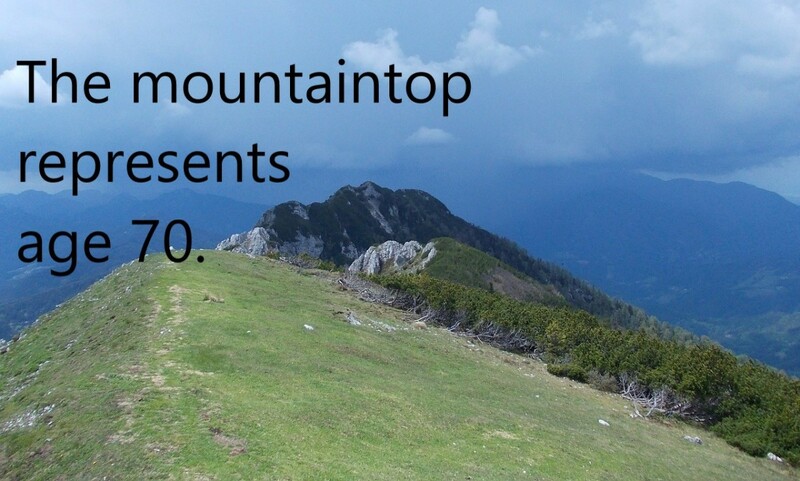 We inquire about those who are not on Facebook and Twitter. 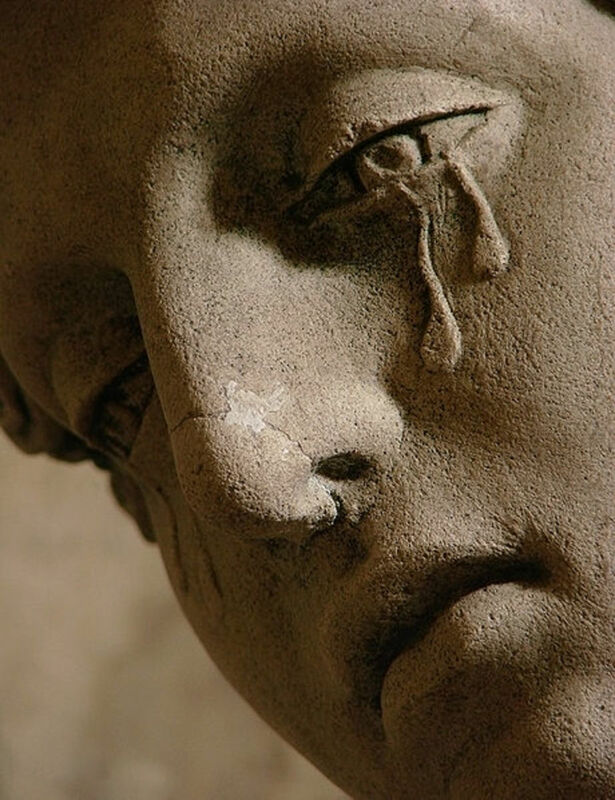 We express sorrow at the news of those who passed on. We confess our complex thoughts about aging and we cheer ourselves with laughter when we exchange insights to help us cope. Because of the meaningful experiences we lived through together in our early years, we know how to communicate at soul level with our first adult friends. On our journey toward and beyond seventy, these long-lasting connections are the ones we cherish the most. In our thirties, we were struggling for recognition. 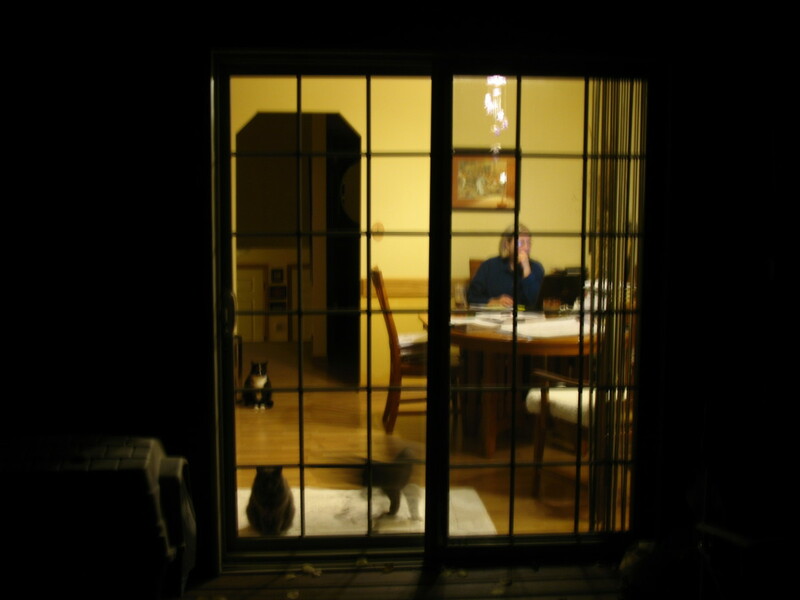 Our modus operandi in dealing with obstacles likely became a permanent pattern. In our effort to keep up with career goals, we sometimes neglected house and home. We wanted recognition for our hard work. We needed ample income to pay the bills, treat our children well and afford a vacation. The struggle to meet our goals helped us to improve our performance and appreciate the money we earned. Now, approaching seventy, we still may not know for sure how we pulled through. What we do know is that perseverance pays off; that recognition is not nearly as important as good health and happy relationships. The grit which carried us through our thirties can still support our determination to eat nutritious foods, to balance activity and rest, to share love and support, all in the interest of our well-being. There's still some struggle left in us. In our forties, we discovered who we really were--our abilities and our limits. We settled into our true character. Not that we ignored identity earlier on, but by this decade we realized that keeping up appearances was not worth the effort. We became tired of being people pleasers, of putting our own ideas on the back burner, of stifling the ambition we shelved since our twenties. We either woke up, stepped out of our comfort zone and became the leader, the entrepreneur, the musician or actor we were designed to be; or we laid back and continued to babysit other people’s passion. What matters now is that each person is satisfied with his self-description. Hurrah to those who are! To the rest, becoming seventy is an ideal time to begin becoming who we were meant to be. In our fifties we began to reap what we had sown, be it wild oats or honest labor. We were grateful to have lived for a half century, but also fearful that we had lost half a century. We realized that we had probably lived half of our lives. We became sober at the thought that some of our actions could not be undone. The consequences showed up in our credit score, in the type of social circle to which we belonged, in our health profile, in our children and protégées who valued our presence or in some peers who preferred to avoid us. It was time to check our self-approval rate. We watered the good deeds so they could increase. However, there are still some bad habits to change, and to this day we still have some seeds to plant. That's one reason we're still living. In our sixties, we were surprised that we were that age. We talked about “When I was a girl (or boy).” We were experienced enough to do more in the next ten years than we did in the last thirty. We seemed to get there quickly, but we only had to look at our children and grandchildren, nieces and nephews to verify how far we had come. Every time we marveled at how much they had grown, and how electronically savvy they were, we reminded ourselves of our aging status. We were already in our fifties when our eighteen-year old grandchild let us use his iPod which was released in (2001), the year he was born. We were already in our sixties when our eight-year old great grand child explained the iPad which was released in (2010), the year she was born. With the years we have left, we may try to impress these young ones with the beautiful intimacy of face to face communication, handwritten notes and touching palms void of cell phones. We may also set our minds on adapting to the changes. We can! There are many reasons for celebration and gratitude. Looking back has given us hope that we can continue to work at our unfinished business, to learn and grow even as we age. The quote below is full of anticipation for those becoming seventy. My word to them is congratulation. . . You ought to be jubilant because life is a tremendous struggle, and, if you have got through respectably and usefully, you ought to feel like people toward the close of a summer day seated on the rocks watching the sunset. We can see the finish line. For a while, we have time to express thanks to the people and agencies who supported us and helped us survive. We have time to admire the sunset. We have the opportunity to solidify the legacies we will leave behind. Thanks, Cheryl. Best of life and health to you on your way to 70! Great article. I look forward to 70 in 9 years. Thanks, Mona. At the beginning of every year, so many people tell us to forget the past, and they have good reasons. However, there are times when looking back has benefits and as you suggest, the younger ones can also learn. I tried comparing my life through each generation in your article, and agree with each one. However, for the life of me I have no idea what my forties was like. Isn't it strange, losing memory of one entire generation of one's life? Also, I have yet to reach 70. I'm glad that you wrote this article because it allows everyone to compare their lives to it and to think back. We so rarely look back. Thank you, Devika Your counsel is appropriate. Time to appreciate another period of life. Thank you, Kathy. Great that you're happy and healthy in your sixties; may your seventies be as good or better. At some point you feel everything and every one around you has become simpler or easier. You have seen life through some of the toughest of decades. There you are now at a much peaceful time. Appreciate this time and you have shared with great wisdom. Great article. I struggled through most of my decades. But now in my early 60s I find the struggles are less and the living more. Stepping out of the work race to nowhere helped tremendously. Having family close helps too. Last, but not least, good health is with me again. This is an article to come back and read again and again for the wisdom within. May you have a blessed and healthy 70th year. Sampsons, welcome to HubPages! Yes, aging is a privilege since everybody who wants to experience it, doesn't get the chance. Happy to share my perspective. Thanks, Rajan. Looking back and reflecting has its learning advantages, plus there are many good memories. I had never thought of aging as a privilege, but it is indeed. Thank you for that eye-opener. I liked how you broke up the life experiences by the decade and the lessons learned therefrom. We can learn a lot from each passed decade of life and take a lesson or two from it for the coming decade. Congratulations on reaching this milestone this year, Dora and may you remain healthy and happy in the coming years. Bill, approaching seventy and having time to reflect is a privilege I appreciate very much. Thanks for your continual support. Congratulations, Dora. Time has taught you a lot, and we here at HP appreciate the fact that you regularly share your wisdom with us. Enjoy the next decade, my friend. Thank you, Chitrangada. I accept your good wishes and yes, I'm loving my life where it is. Alyssa, thanks for reading and commenting so kindly. I'm encouraged. Awesome article and there is so much to take away from this. I liked how you touched every landmark age. Aging gracefully and loving it, that is wisdom. Congratulations for turning seventy. Wish you good health, more happiness and more wisdom and a happy and content life always. Thanks, Lori. I would like to meet you too. What a blessing is the promise of heaven! Instead of counting the years, you look forward to the destination. That's a wise perspective. Thanks for sharing. Thanks, Shauna. You said it well. You've earned. We've earned it and that attitude of contentment is good for our health. Thanks for sharing. Best to you going forward. Ah Dora, this was spot on. 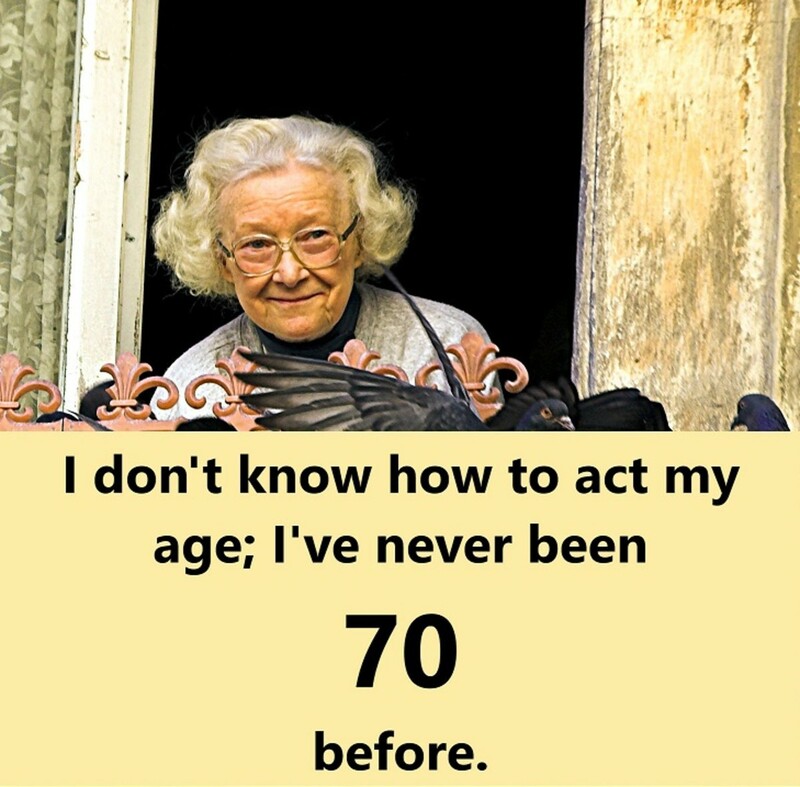 Congrats on seven decades, We all know you here at hubpages as a very wise woman. Of all my HP friends you are one of the ones I would most like to meet face to face. I'm in my early 60s and know 70 will be here before I know it and I am at the point where birthdays are no longer an offense. I did not like turning 60, but two years have gone by and I am very comfortable with my age. Each day, week, month and year I am closer to heaven. We will meet there one day soon enough. A very enjoyable read Dora. Dora, this is a wonderful explanation of aging and retrospect. I've just entered my 60's (I'll be 62 in March) and I can't believe I'm in my 60's! I certainly don't feel 61, although my outer appearance is testament to the decades I have behind me. That said, I had a blast getting here and will keep on truckin' as long as I'm able. I have settled down quite a bit and that's perfectly fine. I consider it the end to the means. I earned a slower pace. I earned the ability to make the choices I make today. I earned the luxury of doing absolutely nothing if that's what I choose. I've earned the right to answer to no one but myself. Congrats on turning 70 this year, Dora. Let's have a party! Thanks, Robert. I appreciate you taking the time to comment. That's a very good point, Dora. If we go away on a city break and take in lots of different sights, it feels like we are away for a long time. Whereas if I am at home in routine, time flies. Ann, I like your attitude: "it's certainly a privilege to be able to look back at all!" Thanks for sharing. Liz, I can relate to your question and your observation of time seeming to speed up. One scientist explains that time seems to move less quickly when our brain is recording new experiences; there were many new events in our childhood. The more familiar things became, as in our adulthood, the faster things seemed to move. Therefore, as we age, we can slow time down by creating new experiences, like learning new skills and visiting new places. Linda, I'm looking forward to the day. Thanks for the birthday wishes. Words of wisdom, Dora! You've also given me impetus for a dilemma I have at the moment, so thank you for that. I look back on good times and bad (I'm 67) but it's certainly a privilege to be able to look back at all! I love the way you've presented this in such a clear, interesting and informative way. It made me think and it made me smile. Thank you, Dora. This is a very interesting reflection on the decades. I think people in their seventies now have a much younger outlook on life than a generation or two ago. Or is that just because I am getting older? When I was a child the years seemed to pass so slowly. I feel that, as life has gone on, someone has pressed the fast forward button and life speeds by! Thank you for sharing such interesting and thought-provoking ideas, Dora. I hope you have a very happy birthday when the day comes. Blossom, happy 88th when it comes. You surely have lots of blessings to count and lots of things to celebrate. Thanks for sharing your cheery attitude. Pam, no worries. Mistakes happen and we smile. Thanks again. Wow, Dora! This article has certainly drawn a number of comments and I enjoyed reading it and those encouraging remarks. It's amazing how time passes so quickly, and the older we become the fast it seems to fly. 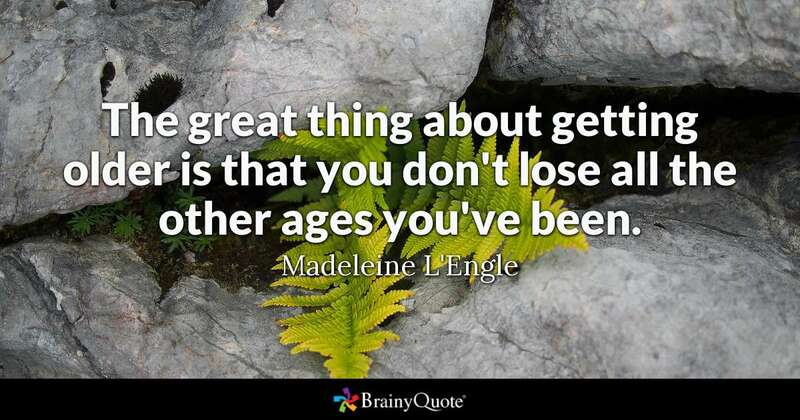 Whatever our age, there is opportunity to celebrate - and grow, which is just as well, as near the end of this year I'll be eighty-eight, a tad over the seventy mark. Blessings to you for the coming year. Dora, The 79 was a typo and certainly meant to be 70. I thought I check what I wrote, but I guess not. Sorry. Hapy 70th Birthday! Mary, enjoy where you are now is the best that can happen to you. Continue to enjoy the scenery. Thank you for sharing. Pamela, happy for you that you're "still enjoying life and family." That's what it's all about. I accept 79th birthday wishes in advance, since you predict it for me (smile). This year, I'll just be 70. Thank you. You've defined the life stages well. I have seen these in my own life. I am now close to 70, too and I am enjoying where I am at now. The early years were a struggle in knowing myself well, what my mission really was, the climb to the top and now, this is like being in a plateau and enjoying the scenery after the hard climb. Hi Dora, I am embracing my 70s the best I can, still enjoying life and family. I love your article as it described many things associated with all of the past ages. I was in my mid-thirities when I got my bachelor's degree, so a slow start I guess, however, I loved working as an RN. Bill, we are blessed to approach seventy with a passion for life. Thanks for being part of my present circle in the writing world. Thanks for sharing such a positive testimony: "My life is full and I understand so much about love." Blessings on you, too going forward. Well here we sit, my friend, at seventy and loving life. The descriptions are pretty accurate. My thirties were a struggle for sure, but now, despite slowing up a bit, my life is full and I understand so much about love....thank you for this, and blessings to you always. John, good point you raised there about using the time wisely; it makes a big positive difference. Glad you could relate to this setup. Thanks, Flourish. Meeting people as kind and supportive as you helps make the journey pleasant. It does get better. Happy 50th to you in advance. Jackie, Oh to be young like you again, but I wouldn't trade this moment at this age for anything. Hope you enjoy your journey as well. Thanks for your input. Tim, I appreciate you. Hope you have many more birthdays and make it safely and happily all the way. Eric, you've always been kind in your comments. You're going to be one of those oldies who make younger ones want to be like you. Thanks! "The end of a matter is better than its begining, and patience is better than pride"
Remember reading in a book years ago, what ever project we're working on, always finish well. "Do not say, Why were the old days better than these ?" 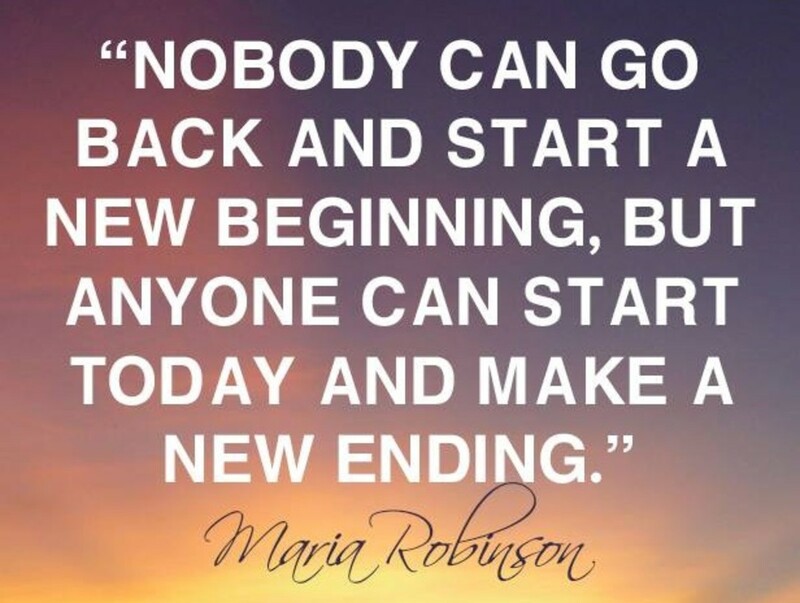 But as the quote says, "Anyone can start today and make a new ending"
This is a wonderful look at each decade of our lives MsDora, and I admit mine has been very much in tune with these descriptions. Each decade seems to speed by faster than the previous one, unfortunately, but we learn to make the most of our time rather than wasting it. A belated happy birthday to you as you embark on your seventh decade of life. You are a lovely soul. I enjoyed your synopsis of the decades. 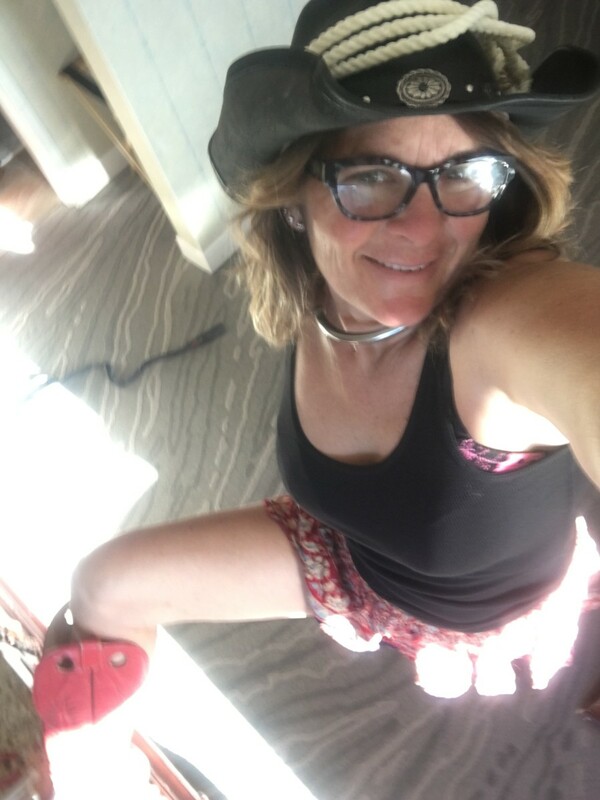 I will be 50 in a few months and it feels like life is getting better. May that be true for you as well! So beautifully said, Dora. One thing I am surprised about getting older is not losing hope, still looking forward to a future. In my forties, I would have not imagined 60s might be even better. We can grow at any age and it gives us youth of a sort. So true about looking back at friends. That time never dies in our mind or in our hearts. I look forward to celebrating in my seventies! Thank you for that hope. This article is good for anyone at any age. It gives people some idea as to what to expect or some direction to go. Although I have decades to go until the age of 70, I enjoyed reading about the "big picture" you offer. Always well written, always full of good reliable information, and always something positive to think about as a reader reads your work. ...to embrace the privilege with joy." "We watered the good deeds so they could increase." "to learn and grow even as we age". In my sixties I try to remember that at whatever cost of error it got me here which is exactly where I want to be. But now I temper such with the knowledge that I can still learn from my errors of the past. Maybe having a wife near 20 years younger, yet more responsible and an eight year old who is wiser drop kicks me into a different goal. Great stuff here to reflect on. And of course your writing is top notch. I have studied you as you integrate "citations" so brilliantly. Maybe by seventy i will get it down.